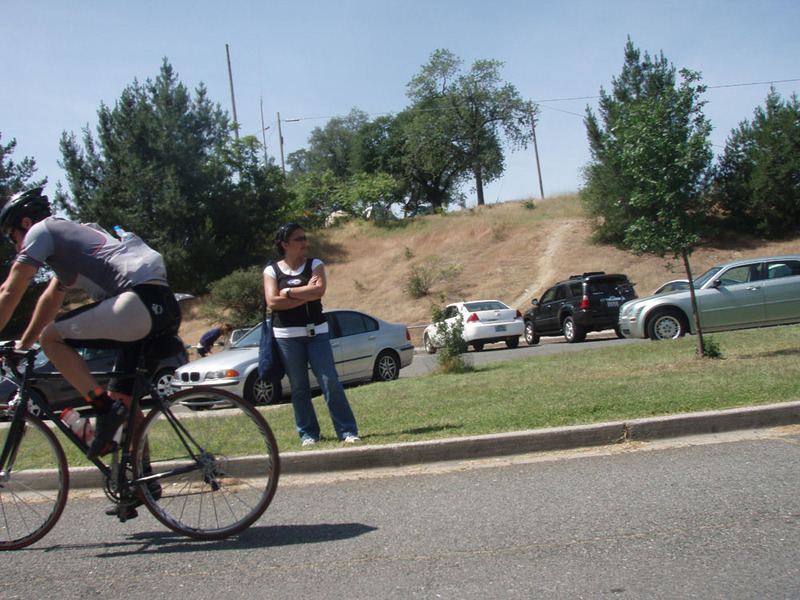 And so is how the 1.2 mile swim started for me at the ‘World’s Toughest Half-Iron Triathlon’ in Auburn, California. They say that you should always focus on the task at hand and not your finish time, average speed, etc. My focus was on not sinking. For whatever reason the swim started out poorly for me and I could not catch my breath. All the technique that I had worked so hard on went out the window. Possibly related to me not doing any open-water swimming or wearing my wetsuit since this race last year. The last 500 meters were probably the best I felt. Out of the water at 7:47am; I thought the swim took 47 minutes, which seemed accurate, considering how poor I was feeling. Ends up it started late and my swim was 39 minutes, only 4 minutes off of last year. In this picture I look like it took 3 years. On the bike and stoked. What else can I say? My plan: go as hard as I could and not think about the run. This is my third triathlon and I think I can diagnose what I get on the bike as ‘Poor Swimmer’s Syndrome’. I am more amped, aggressive, and competitive on the bike part of tri’s than in bike races. I’d pass someone with Aerobars and Zipp wheels, they’d step on it and try to over take me again. I’d hear them breathing heavy so I’d push down a little harder. Slowly their breathing would become inaudible and it would feed my aggression. Odd, right? Wanted to sub-3 hour the 56 miles (600o ft elevation gain), but ended up around 3.14. This includes both transitions, which I am slow at (note that I am sitting in the picture!). 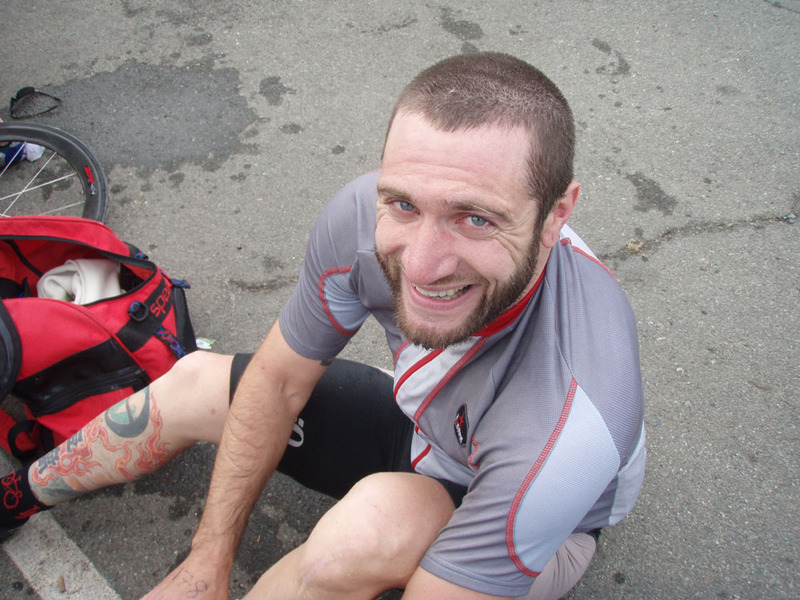 Only 5 people did sub-3 and my ‘bike split’ was ranked 31st out of 200 (Overall results). The course was more up and down then any long or steep climbs. So beautiful. Little traffic. Run! The route is almost 100% off-road with technical sections of roots, rocks, streams, etc. Also two STEEP, long climbs. The first part of the figure-8 was tighter. Some rocky downhills. No coasting when running! A couple of people passed me, but I eventually got into a groove and picked it up. 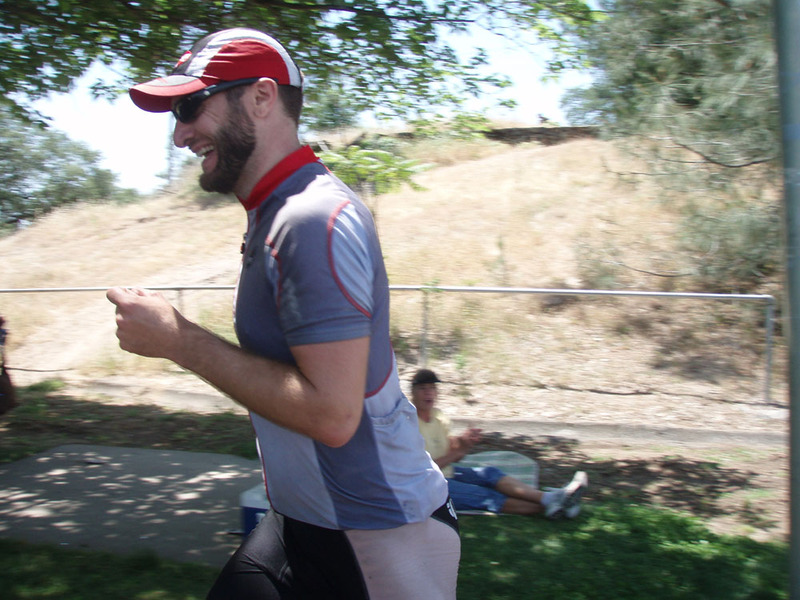 You run past the finish before heading out for the last 10k (6.2 miles). I noticed the clock for the first time: 5 hrs 02min. I’d have to run a 58 minute 10k to sub-6 overall. This motivated me and I managed to not struggle nearly as much as last year on the last long downhill. It’s brutal. My arms hurt from the swim and the impact was exasperating it, but overall, really, I was stoked and having a great time. Ran the whole way back up as fast as I could. Finished in 5 hr 58 min. Despite the longer swim beat last year’s time by 7 minutes. Also got 5th in my age group this time, but got better awards (olive oil and cytomax!) than 3rd. This race is so fun and run super well. Apparently it is ‘much different’ from other triathlons, which reinforces the stereotype of others. This one is super DIY and ‘grassroots’. The real endurance test was driving back to LA after the race and then getting up at 630am for work the next day. So the question is: Will I be ready for the World’s Hardest Full-Iron in Norway? I’ve got two months of training. Thanks to my father for the x-mas gift (covering the registration) and to Uncle Bob for putting us up. Also my great (unofficial) support crew and photographer. 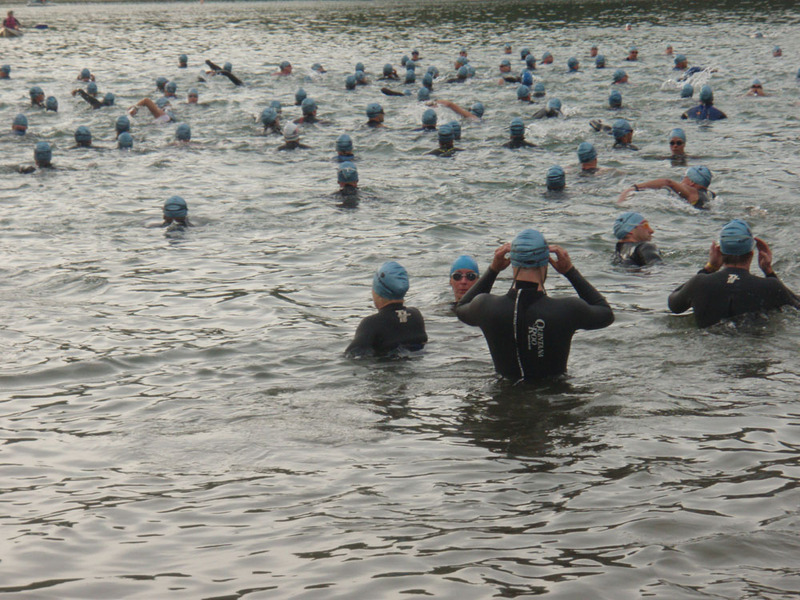 I just realized I’ve never seen anyone warm-up for the swim (by swimming) at a Tri. Maybe I just never noticed, but maybe that could be your advantage.